Notes: - Scarce envelope design. The above Royal Mail Ulster '71 Paintings stamps were issued on 16 June 1971 by Royal Mail and feature the following stamp designs: 3p A Mountain Road; 7 1/2p Deer's Meadow; 9p Slieve na brock. 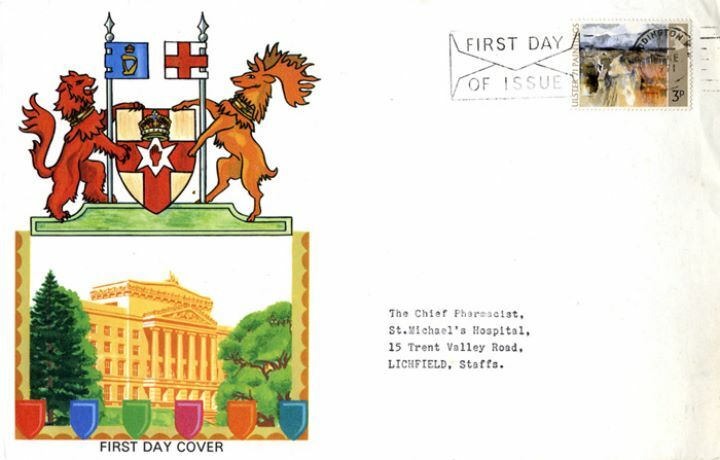 The Coat of Arms first day cover with the Paddington, First Day of Issue - Envelope Style, Slogan Postmark postmark and features these stamps which can make a very collectible and lovely gift.